Ecologist • IAP World Services & Cherokee Nation Technical Services, Patuxent Wildlife Research Center, MD 2009 – Present · Integrated NCBN nekton and vegetation monitoring data into a multimetric index (MMI) for evaluating, predicting, and comparing salt marsh condition at local and regional scales. Coordinated a journal special issue representing a synthesis of a 7-year multi-investigator interdisciplinary project that evaluated the physical and ecological influences of watershed condition and shoreline development in the Chesapeake Bay and in ocean embayments along the Delmarva Peninsula. · Developed, maintained, and performed statistical analyses of large ecological datasets pertaining to the effects of climate change and management practices on ecology and sediment dynamics in East Coast and Gulf of Mexico wetlands. · Analyzed and synthesized data relating to marsh sediment elevation and marker horizon dynamics, marsh vegetation and nekton diversity and productivity, porewater biogeochemistry, water level dynamics, and sediment decomposition. 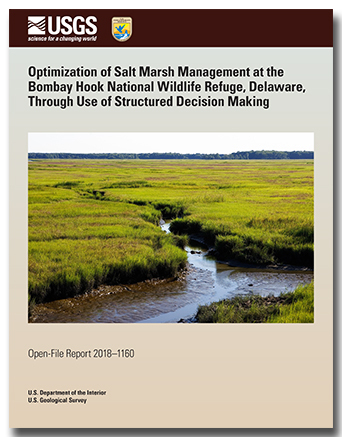 · Conducted statistical analyses and extensive literature reviews to aid in the development of indicators of salt marsh health to aid management decisions. · Created summary tables, figures, text, and graphics for presentations, reports, and manuscripts. · Designed a Fact Sheet and website for disseminating research goals and findings to the public. Ecologist • U.S. Geological Survey, Patuxent Wildlife Research Center, MD 2005 – 2009 · Assisted in the conduction and coordination of large-scale research projects aimed at assessing the response of U.S. coastal wetlands to global climate change and prescribed burning. · Designed and executed a research study to determine the combined response of marsh plants to nitrogen fertilization and prescribed burning at Blackwater National Wildlife Refuge, MD. · Related research skills include measurements of marsh surface elevation using sediment elevation tables (SET) and GPS-determined elevation, identification and processing of wetland plants, analysis of soil and plant characteristics, and deployment and maintenance of water level gauges. Graduate Research & Teaching Assistant • Horn Point Laboratory, MD 1999 – 2005 · Conducted dissertation research on the importance of plant-sediment interactions to biogeo-chemical cycling, ecosystem metabolism, and restoration in seagrass beds in Chesapeake and Florida Bays. · Assisted in the development and editing of various grant proposals and reports. · Gave lectures on seagrass ecology and led recitations in a graduate level Ecology course. Undergraduate Research Assistant • Roger Williams University, RI 1997 – 1999 · Analyzed macroinvertebrate populations as indicators of pollution in Rhode Island streams. Contacts: Hilary Neckles, Ph.D., Glenn Guntenspergen, Ph.D., Jessica Nagel, Ph.D., Donald Schoolmaster, Ph.D., James Grace, Ph.D. Contacts: Hilary Neckles, Ph.D., James E Lyons, Ph.D., Jessica Nagel, Ph.D.
Neckles, Hilary A.; Lyons, James E.; Nagel, Jessica L.; Adamowicz, Susan C.; Mikula, Toni; Guiteras, Susan T.; Mitchell, Laura R.
Neckles, H.A., Lyons, J.E., Nagel, J.L., Adamowicz, S.C., Mikula, T., Guiteras, S.T., and Mitchell, L.R., 2018, Optimization of salt marsh management at the Bombay Hook National Wildlife Refuge, Delaware, through use of structured decision making: U.S. Geological Survey Open-File Report 2018–1160, 18 p., https://doi.org/10.3133/ofr20181160. Prosser, Diann J.; Jordan, Thomas E.; Nagel, Jessica L.; Seitz, Rochelle D.; Weller, Donald E.; Whigham, Dennis F.
Prosser, Diann J.; Densmore, Christine L.; Hindman, Larry J.; Iwanowicz, Deborah D.; Ottinger, Christopher A.; Iwanowicz, Luke R. ; Driscoll, Cindy P.; Nagel, Jessica L.
Prosser, D. J., Densmore, C. L., Hindman, L. J., Iwanowicz, D. D., Ottinger, C. A., Iwanowicz, L. R., Driscoll, C. P., and Nagel, J., 2017, Low-pathogenic avian influenza viruses in wild migratory waterfowl in a region of high poultry production, Delmarva, Maryland: Avian Diseases, v. 61, no. 1, p. 128-134. Singh, Sunit K.; Prosser, Diann J.; Nagel, Jessica L.; Takekawa, John Y.
Neckles, Hilary A.; Guntenspergen, Glenn R.; Shriver, W. George; Danz, Nicholas P.; Wiest, Whitney A.; Nagel, Jessica L.; Olker, Jennifer H.
Neckles, H. A., G. R. Guntenspergen, W. G. Shriver, N. P. Danz, W. A. Wiest, J. L. Nagel, and J. H. Olker. 2013. Identification of Metrics to Monitor Salt Marsh Integrity on National Wildlife Refuges In Relation to Conservation and Management Objectives. Final Report to U.S. Fish and Wildlife Service, Northeast Region. USGS Patuxent Wildlife Research Center, Laurel, MD. 226 pp.